Hello! Welcome to the first day of summer and the beginning of what I hope is going to be a fun and exciting journey for all of us. I figured I’d start with a sneak peak at the initial drawing I’m giving my sister to start it off. I don’t know about you, but as a kid I loved to color – so I made a little coloring page to start off the whole project with something fun. As for me, I’d like to reclaim that feeling of endless time and endless possibilities that I used to feel at the beginning of each summer. I say no! to doing things because we “have to” – and yes! to enjoying free, unstructured play – even as adults. Who says everything we do has to be utilitarian? Go for a run without keeping track of speed or miles, eat that ice cream sandwich because you want to and forget the calories, go barefoot, or do a cartwheel in the grass just because you feel like it, no matter how silly you think you look. 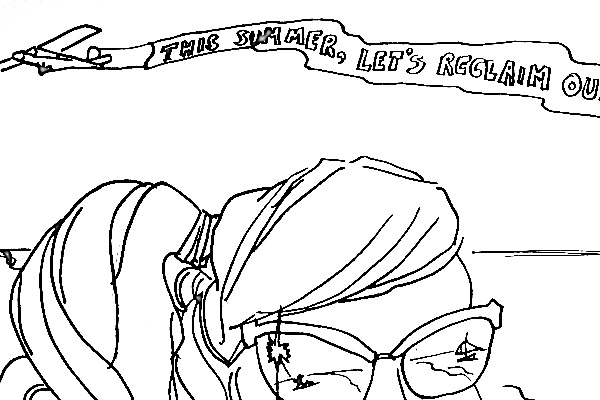 Posted in the project and tagged coloring, play, summer manifesto. Bookmark the permalink.